is no bat and mosquito inside. The caving probably takes you 1.5 hours. 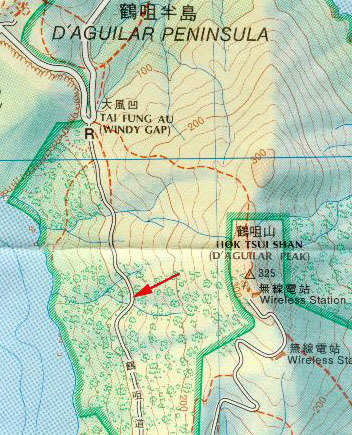 The red arrow in the map indicates the entrance and the exit. Yes, the entrance and the exit are pretty close together. (1) Lie a rope around a tree at the entrance, and you carry the other end of the rope into the cave. This is to make sure that you can always find your way back. 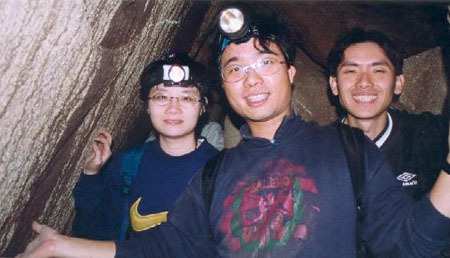 (2) Visit the cave in dry seasons only. In wet seasons, the cave will be very slippery and the cave may accommodate water pools inside. 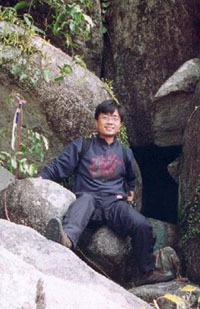 Eugene is sitting beside the entrance of the cave. Right inside the entrance, you have to overcome a big rock before you can land on solid ground. 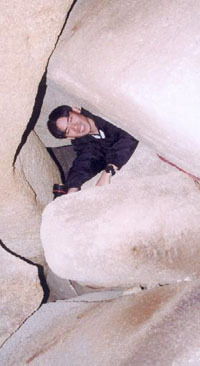 The cave has a small upper chamber and a series of lower chambers. 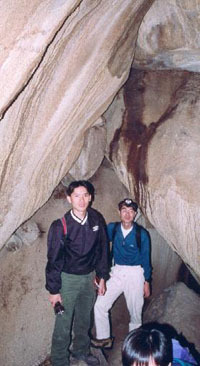 This picture was taken inside the upper chamber. 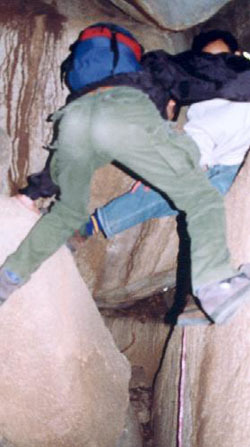 On the way to lower chambers, the first challenge is to claw through a series of narrow channels. It really takes you gut to cram into darkness. Look before making your next move. The lower chambers are big enough for an adult to stand up and take pictures. Don't be fooled by this picture, the lower chambers are in complete darkness.